It was built on a high bank of the Dnipro in 1635 by the French engineer Beauplan on the order of the Polish government. The cossacks attacked it many times, vying for mastery of the land. It was finally destroyed after the Prutsky treaty in 1711. 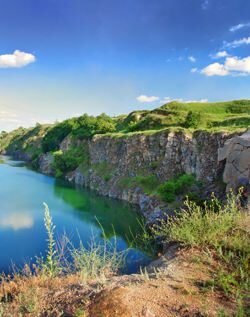 In Soviet times two thirds of the fortress’ walls were destroyed by a granite quarry. Kodak had the misfortune of being placed on the Ukrainian Crystalline Shield. Thus, the fate did not favor Kodak. The proximity of Dnipropetrovsk also had a negative impact on the monument (providing granite was all that mattered). Talks about the creation of a historical park didn’t go anywhere, regardless of muted protests by local intellectuals. They were only taken into account during the perestroika, and the monster-quarry was finally closed. In spite of museum’s modesty it has a soul. It is also a place where you are not ashamed to bring guests. I brought many people here, as I know that Nina or her son will always open the museum. They are always many lots of others. Last summer doctor Zenon Kohut, professor of history at the Canadian Institute of Ukrainian Studies, from Edmonton showed up here. Oleksii Lazko, founder of the international public organization “Institute of Ukraine” brought him here. He also organizes picturesque holidays in Kodak. The professor and his wife were filled with admiration of what they saw and heard. “I had an opportunity earlier, when I was in Katerynoslav with the children, to see the first rapid of the Dnipro in Kodak, which is in eight or ten versts from Katerynoslav. The weather was not calm, but completely different and uniquely beautiful – it was in summer, a very sunny day. We came from Katerynoslav to Kamianka [referring to Lotsmanska Kamianka. – Author], and from there to Kodak by horse. When we came closer, we stood and looked at the place of the old cossack citadel and at the Kodak rapid, whirling and roaring across the entire river. A terrible hour came: it thundered, the lightning sparkled, blue and grey clouds twirling in wreaths. The entire picture was so majestic and beautiful that it seemed to be the creation of an unseen magician! The inconceivable magic of Kodak. How many writers reflected on its glorious Cossack past! I will list several names: Teodor Mykytyn wrote the historic novel Above Kodak (published in Lviv in 1970), Valentyn Chemerys wrote Fortress on Borysfen (Dnipropetrovsk, 1993). Before that Volodar Buzhenko’s historic narrative Ivan Sulyma (1961) was printed in Toronto. Volodar Buzhenko is a pseudonym of Vasyl Zinko, priest of the Basilian Order… He admired the Cossack leader Ivan Sulyma, who was the first to destroy the Polish stronghold. 360 years later the Description of Ukraine (1650), by the builder of the fortress Guillaume Le Vasseur de Beauplan, was published. The members of the French Academy read it, it could be found in the libraries of Descartes and Voltaire, Louis XIV and Napoleon… for us it is valuable because 360 years ago the world learned about Ukraine. Not about “kresy,” not Little Rus, but Ukraine. Kodak has many dimensions. Let us go back to the Stari Kodaky museum and its founder. The whole community helped Nina Protopopenko create the museum. Deceased artist-amateur Volodymyr Panchenko accidentally happened to come to the village: he bought a house for his mother, who became a librarian in the club. He offered his pictures to the museum. Here on one of them a beautiful fortress rises above the Dnipro. Since it was created by the artists imagination one can only guess if it was really like that. But artistic reconstruction is interesting and gives visual understanding of the amazing monument located above the Kodak rapid. In another picture there is a wonderful Stari Kodaky Cossack wooden church, which cruel time did not preserve. But it remembered Dmytro Yavornytsky, and Vasyl Tarnovsky – brought by the historian to the village. Another picture of Volodymyr Panchenko shows pilots [icebreakers. – Ed.] on the Dnipro. In the neighboring Lotsmanska Kamianka a museum of pilots was created by the retired teacher Hryhorii Omelchenko. He also blessed the Stari Kodaky museum. I started remembering the devotees, whose tired souls had left for heaven already, but whose energy remained with us. It is a heirloom more precious than silver and gold. Grateful visitors remember and will remember them. Thank you for your restlessness. Recently I reread the text of the pilot oath from 1910 in the museum. There are many things in it about faithfulness to the Tsar, but there are also eternal moral issues. May their descendants read it. And there is a Cossack, carved from wood and presented to the museum by the generous and skilled craftsman Yuri Shkovyra. A quarter of a century ago he and his wife settled in Stari Kodaky. Yuri Shkovyra, geologist, Ph.D. in Geology and Mineralogy, former university professor, and admirer of Ivan Kotliarevsky, created his own poetic Eneida and other books, for which he was accepted to the National Union of Writers of Ukraine. He decorated his house with funny bas-relief characters from Kotaliarevsky’s Eneida. The cars are rushing by but involuntarily slow down. God gave many talents to Nina Protopopenko. She is a director of the club, founder of the museum, and a keeper of local memory. But it is not all. Years ago she was the head of the Kodachanochka folk ensemble. Now the ensemble, consisting of 14 singers, successfully perform on Independence Day in Dnipropetrovsk, and are invited to the memorial house-museum of Dmytro Yavornytsky… They have around 50 songs in their repertoire. In April they are to be awarded with the title of national ensemble. Tamara, Nina’s sister, sings in the ensemble with pleasure. The sisters have lived in Stari Kodaky since 1964, when their father Oleksii was transferred here to work as a head of department. They soon understood that they found themselves a new home. Should they care about stilted Dnipropetrovsk? When the metropole was not but grass Kodak was already there. Nina Protopopenko is a jack of all trades: she sues costumes, skirts, and sharovary… Everything burns in her hands. In a big hall in front of the cabinet-museum you can see her pictures. Can you imagine so much talent! She paints under the influence of folk songs and poetry. And, certainly, the soul lives through song. Last time she and her sister sang us with Lesia Stepovychka “Song about Mother” to the words of Borys Oliinyk (“I sowed my years for the people, cleaned the planet, sowed knot grass on the paths, I taught the children how to live according to conscience; I sighed and went behind the border”). The sisters speak of how they cried before they learned the song… Because they lost their mother early. I did not go to the museum for a few months and now I see addition – old naive pictures as big as half the wall. - Where have you got these from? Fellow villagers are ready to hand over precious rarities to the museum (the suburban village is specific: because of its picturesqueness the major part of it is settled with vacationers). 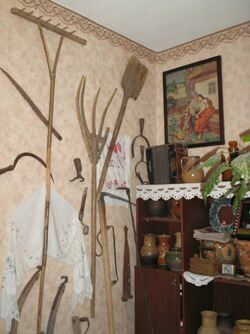 There are no storerooms in the village museum, and everything which is presented is exhibited for everybody to see immediately, it is not hidden from people. It is such a contrast between the eternal openness of our nation and the brutality of the modern world, where stealing from unprotected museums is a mere sport… But thieves will not read this. And the soul comes to the museum as a fearful bird to warm up there.